Flopped 2pr - when to bet? Live 1/2 game. This is first hand of the night. UTG just sat down, too. I have no read on any of the players. This is a situation that I often find myself in and I'm unsure how to play it. I'm in BB (or I could be in SB) in a limped pot and I flop two pair. In this hand, board is dynamic with plenty of draws. Do I lead the flop or plan a check-raise? In hands where I call a PF raise, I would usually plan to check raise two pair+ hands (balanced by nut flush draws and some stronger combo draws like T8, A8s, etc). This is a limped pot and I feel like I play way too passively these types of hands. so why did you keep checking? you have a strong but vulnerable hand. alot of worse hands can give action here. i can be on board with a flop check raise or maybe a turn check raise if you really wanted to slow play, and you were set up for both but didnt pull the trigger. go for value! Calling down is fine here unless you have a read that he has J10, KT, A10 exclusively. Wanna look at the timing of the bets. Is he quickly betting or pausing before each bet? Might throw in a half pot $30 donk river bet. @keasbey I thought on the turn that my opportunity to check-raise was on the flop, which was why I proceeded to check-call. Didn't really think draws would continue vs a turn check-raise, so my check was more about letting weaker hands bet. @Austin He was betting fairly quickly. I didn't think he was pausing too much in the hand. Quick bets are usually capped at one pair. This is more of a live read type thing and not really part of a range construction. In general you do not want to check raise this hand because vs a 3bet and get it in range your crushed for the most part. Better off check calling or taking the lead and betting 3 streets yourself. If you go through the forum you will see several post of people playing bottom two pair aggressively where the optimal line is to play a bit more passive. I would treat A10 (TPTK) similar to 97s (bottom 2) in this spot. Get like 2.5 streets of value. So what is the thought process here for treating bottom two with such caution? it was a limped pot in a game where at least in my player pool, players love to greedily chase draws even with very incorrect odds. 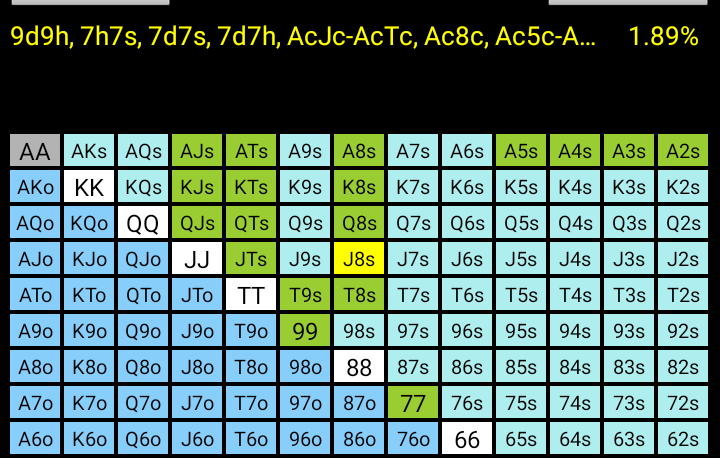 Except for exactly 86 or J8, hero blocks many nutted hands.. theres only 1 combo of 77, 1 combo of 99 and 3 combos of TT. Hero does block some combos of T9o and T9s which are almost definitely in the limp range. Here, you are better than JJ-AA, all sorts of random club club hands that 1.2 players like to limp and chase with, a bunch of straight draws that 1.2 players like to limp & chase with, all hands which could call a XR that you do well against equity wise. Facing a flop 3 bet i would try to decide vs player type. Players that like to toss around chips on a straight or flush draw.. i would look to get it in with bottom 2 but against a more straight forward tag type you are probably in bad shape. But to me at the end of the day there seems to be alot more combos that you can extract value from if you go for a XR than combos that have you waxed when facing a 3B. Do I lead the flop or plan a check-raise? Yes. Do one of these for sure. I would defer to leading the flop since I would also likely lead the flop with non-nutted flush draw. Equity against this range is only about 42%. While its great to have 2 pair and they may be drawing its not a great hand to get all in with. I'm going to Check raise or lead out at this flop. I'm not check calling, especially not multiway. There are lots of hands to get value from here. As played on the flop, I'm going to lead out at the turn so he cannot check back. So I'm denying equity plus getting value from some hands. I will reassess if he shows resistance. Of course, with particular player reads I might play differently.. Thanks all. It seems like I need to take the lead on the hand. This will definitely be a new tactic added to my game. effective stacks would really be helpful. You should try to always know effective stacks so you can estimate SPR on the flop, but if you can't remember effective stacks when you post a hand, please just make something up close to give us! Effective stacks were 200. We both bought in for table max. BTN had about 250, SB had over 300. I'm ok with leading or calling, check raise I strongly disagree with based on equity when players get it in. If you want equity to drop, then call flop and lead the turn. It's a little funky but it's live poker and crazy things happen. Discussion Flopped 2pr - when to bet?